Does any country have an official celebration for the annexation of foreign territory? Most nations/countries celebrate their independence from some foreign power, a historical victory over aggressors or the end of a war. Are there any modern era examples where a historical event of annexation is being celebrated? Note that I do not mean the case where native populations regain the control of an area lost to invading armies, but an invasion which is celebrated by the invaders, as a glorious event. 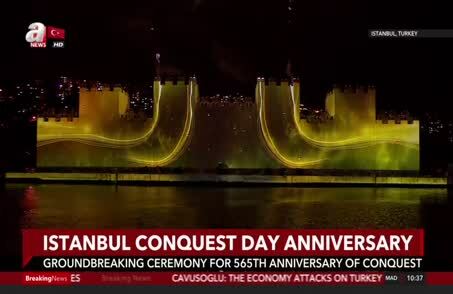 Turkey celebrates "Conquest Day" on May 29th to commemorate the Fall of Constantinople. On this occasion in 1453 the Ottomans took the Byzantine capital and made it their own capital. In the modern Turkish Republic, May 29 celebrations have been a way of appropriating the imperial past for the national present. After an initial period of ambivalence following the founding of the republic, public memory embraced the quincentenary of Constantinople’s conquest in 1953. Yes, there are at least two such cases. Guanacaste Day is celebrated in Costa Rica to commemorate the annexation Guanacaste province from Nicaragua in 1824. However, my very brief research indicates it was a peaceful annexation, not the result of war. More recently, the Russian parliament voted to create a holiday commemorating the annexation of Crimea in 1783 to be first celebrated in 2019. Yes. Romania celebrates on December 1 (Great Union Day) the annexation of Transylvania from Austria-Hungary. On 6 November every year, Morocco celebrates the Green March, which led to the annexation of Western Sahara which was held by the Spanish at the time. Not a complete country, but a faction within the country. William III invaded Britain, with popular support from the majority-Protestant population. Northern Irish Protestants still celebrate the Battle of the Boyne, where William crushed James II/VII's army and ended any real opposition to his invasion. Of course, this is an artifact of the fractured society of Ireland, and subsequently of Northern Ireland. Elsewhere in the UK you'd be lucky to find anyone who's heard of William III or that battle, because British colonial exploits have generally been rather badly taught in schools. In the current form of the question, I'd suggest Germany, Italy. Caveats apply. One question in the comments below the original question that arose displays nicely how flawed the concept asked about really is as it depends very much on opinions. Does the Day of German Unity, observed annually on October 3, count? Of course that would count. This inherently essentialist and nationalistic concept of 'former owners' would be what in that case? Nazi-Germany taking it back? Of course not! Unless we recognise the Federal Republic of Germany to be the seamless continuation of statehood of the Third Reich. Did the Red Army not leave and NVA cease to exist while the NATO rolled in? Was it not explicitly an annexation as devised by the basic law of the West (as opposed to the also envisioned unification)? There are opinions out there that still only speak of annexation of the GDR. Feb 19 – GDR Prime Minister Modrow criticizes the plan to introduce a German currency union before elections are held in the GDR. He points out that a currency union must be combined with a social package. The participants at the Round Table protest against the annexation of the GDR by the FRG according to Article 23 of the West German Basic Law. Mar 1 – The "Alliance for Germany" adopts the campaign slogan "Freedom and affluence––never again socialism". The principal plank in their election platform is the annexation of the GDR by the FRG according to Article 23 of the West German Basic Law. Mar 6 – In a joint declaration, East German Prime Minister Modrow and Soviet leader Gorbachev support the idea of a gradual merger of the two German states, but they warn against the annexation of the GDR by the FRG according to Article 23 of the West German Basic Law. Lothar de Maizière, leader of the East German CDU, speaks out against an unconditional annexation of the GDR by the FRG. July 10 – The coalition government in the GDR is divided over the question […] They also cannot agree on a date for the annexation of the GDR by the FRG according to Article 23 of the West German Basic Law. If, now, the GDR, like the Saarland, accedes according to article 23, without any further changes in the Basic Law, the chosen method of unification will implicitly underline what the irredentists have ways affirmed: that the conditions for Article 146 have not yet been fulfilled That article states: "This Basic Law loses its validity on the day that a new constitution takes effect, chosen by the German people in free determination." And it is quite true: an "accession" of the GDR could not be the same thing as a free decision of the entire German people; because the citizens of the Federal Republic would have to leave the decision to the representatives of the GDR. When, then, if not now, will that day foreseen in Article 146 ever come? Are we still waiting for East Prussia and Silesia? The debate for clarification below the question as well as the debate that this answer has caused illustrate both brilliantly how loaded the term "annexation" is. Technically it is just nothing more than enlargement of territory, yet using that term qualifies the procedure in terms of "yep, OK vs Noway". Yet in case of Germany: "We like them, now, they won't do that!" And in the case of Russia and Crimea: "A typical! They just annex that peninsula, how dare they!". Just look at the idiotic argumentation in this article from the Washington Post: Russia’s bizarre proposal to condemn West Germany’s 1989 ‘annexation’ of East Germany and compare how they quote Gorbachev with what was just quoted above. "Annexation" does not describe or analyse, "annexation" approves or condemns. 2014 - the accession of the Crimea to the Russian Federation (with the formation of two new subjects - the Republic of Crimea and the city of federal significance Sevastopol), which did not receive international recognition. The unification of Germany, officially: the German reunification (German: Deutsche Wiedervereinigung) or the restoration of the unity of Germany (German: Herstellung der Einheit Deutschlands) - the incorporation of the GDR and West Berlin into the Federal Republic of Germany on October 3, 1990. At the same time, a new state was not created, and the constitution of the Federal Republic of Germany of 1949 was enacted in the annexed territories (German Beitrittsgebiet). Whatever any reader's perspective on this "annexation" or "accession" might be, since 1972–74 not only Eastern bloc states, but West-Germany, Australia, the US, the UK, the UN recognised the GDR as territory foreign to the Federal Republic of Germany. As now "invasion gets the flak: it's the same game. Compare word usage in eg British Invasion with what a dictionary says and then the rhetoric of victory over socialism, Treuhand-effects, Buschzulage, de-industrialisation, colonisation, Bundeswehr/NATO expansion into the East etc. – from both sides of the former wall. Again this is over one ill-defined word from the question and opinion over the monotheistic definition of one word. This answer present multiple perspectives and narratives, arguing against precisely "the one and only". Since it has been completely dominated by West German state and corporate actors, East Germany's transformation has taken on characteristics of colonization. East Germans have been economically expropriated as a combined result of unification laws that stipulate the restoration of pre-socialist property rights and of the Treuhand's policy of rapid privatization. In 1989/90 there were basically four options on the table: no German unity, very slow merger, fast merger according to article 146, faster merger according to article 23. Some West-Germans viewed option 23 as illegal, many East Germans saw option 23 as illegal, as an annexation or Anschluss. Most West-Germans and many East-Germans were perfectly fine with that: being the fastest option and illegal. If anyone now wants to challenge the word "territory" I will give up and concede that most people have opinions and "reasons". Perhaps the most extreme example – if not most bizarrely – is Italy celebrating Ferragosto. Introduced to celebrate the annexation of Egypt into the Roman Empire by emperor Augutus. As feriae Augusti on August 15, the day of his triumph when returning to Rome from conquering Egypt and annexing it, still a national holiday in Italy. (Of course, Christians say it is really the Assumption of Mary, but fascist Italy re-emphasised the conquest origin and most ordinary people today just make a holiday, any reasons disregarded). Hawaii celebrates being annexed, ahem, being admitted into statehood, on Statehood Day (3rd Friday in August) demonstrating once more that opinions might change over time. It is not really useful to ask the question in this way. "Former owners" and "foreign territory" depend on definition that sometimes can be quite arbitrary. "Annexation" is a concept that became much easier in recent years. "That's what the enemy does!" Russia reunifying with the Crimea? Iraq reunifying with its province of Kuweit? China oogling on Taiwan? Japan on the Kurils? Annexation (Latin ad, to, and nexus, joining) is the administrative action and concept in international law relating to the forcible acquisition of one state's territory by another state. It is generally held to be an illegal act. It is distinct from conquest, which refers to the acquisition of control over a territory involving a change of sovereignty, and differs from cession, in which territory is given or sold through treaty, since annexation is a unilateral act where territory is seized and held by one state. Does any country celebrate regularly past military victories with the feature of territory added to the celebrating state? That list might get quite long. To perhaps better illustrate the ambiguities involved to answer such a question: we might look at the National Day of Catalonia. Spanish nationalists celebrate the loss of autonomy of that region and Catalonian nationalists mourn the exact same thing and date. Is there any objective way to decide who's right on that matter? Or going again into history: Alsace-Lorraine was officially ceded to the German Reich in the treaty of Frankfurt in 1871. This was celebrated indirectly in Germany as Sedantag. France and many later victorious powers didn't like the result and called it an injustice and annexation. Yet, who were the 'former owners' and was the process illegal? In 1872 the inhabitants were given the choice of option and 90% seemed in agreement of the procedure, officially deciding to become Germans, and two thirds of those who declared their desire to stay French stayed put. As a historian of antiquity I deny either France or Germany that title of "former" or even "original owner". Even Romans are not the original owners of that territory. That title goes to either the Neanderthals or the Old-Europeans that were driven away or assimilated by incoming Indo-Europeans. "Former owners" is either just 'the state of affairs from last year' or a senseless abuse of history. Most often the latter. A lot of polities or part of them have been founded as result of the conquest of their territory. Therefore, commemorating the conquest mixes with commemorating the founding of the polity. Istanbul Conquest Day, mentioned in another answer, is a great example - it does not commemorate the founding of the state, but the completion of the conquest of its core lands. As another example, Valentian National Day commemorates the conquest of Valencia by James I of Aragon from previous Muslim holders and subsequent founding of the Kingdom of Valencia. Australia Day is not very different from commemorating a conquest - just because of lack of serious resistance -, because it commemorates taking possession of a new land while disregarding previous inhabitants wishes and interests. New Caledonia Day also commemorates the incorporation of New Caledonia as a French protectorate in 1853 - not exactly a conquest but not far from it. Spain's National Day is celebrated on October 12th, the day Columbus (re)discovered the American continent in 1492. The chosen date, the 12th of October, symbolizes the historical event in which Spain, about to conclude a State-building process rooted in our cultural and political plurality, as well as the integration of Spain's kingdoms under the same Monarchy, begins a period of linguistic and cultural projection beyond European limits. This "State-building process" and "integration of kingdoms" would be the Reconquista, which ultimately ended with the Capitulation of Granada on January 2nd, 1492, just months before Columbus set sail. So this territorial unification and expansion is officially acknowledged as the motivation of the celebration, although the text of the law using a milder language (the law is from 1987 after all). Italy also has a (not too much celebrated, not a bank holiday) official celebration for its unification, after Piedmont had "liberated" most of the peninsula. But a man's unification/liberation is another man's conquest/annexation, depending on how words and sides turn. Jerusalem Day (Hebrew: יום ירושלים‎, Yom Yerushalayim) is an Israeli national holiday commemorating the reunification of Jerusalem and the establishment of Israeli control over the Old City in the aftermath of the June 1967 Six-Day War. The day is officially marked by state ceremonies and memorial services. Is that former owners taking something back or blunt annexation? We observe an ongoing since then bloody conflict about the 'correct' opinion on that. Not the answer you're looking for? Browse other questions tagged invasion annexation or ask your own question. What caused the shift from annexation of territory, to colonization of territory?